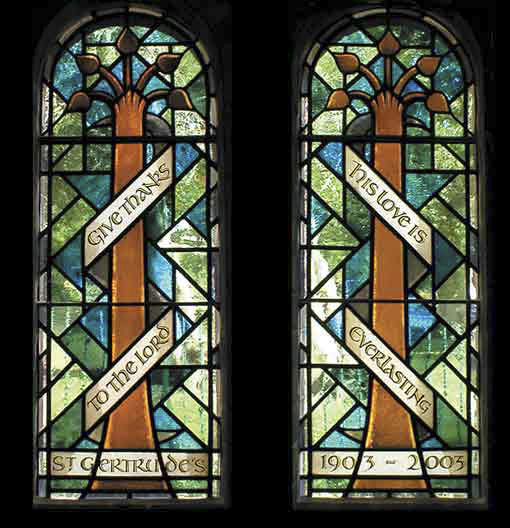 In 2003 I was asked to design stained glass to celebrate St. Gertrude’s Centennial year. The brief was for something fairly quiet. As there is no stained glass in the church except for some simple geometric patterning in the West Wall windows, Father Matthew and I agreed on the Narthex as the best place for the panels. It is a space separated from the nave by a screen and there would not be any undue interruption in the simplicity of the Nave windows and their pale green quarter lights. The Narthex windows will be clearly visible to the congregation as they enter both providing a welcoming warmth to the entrance whilst also being visible to passers at night. The simple lines of the church and the beauty of the decorative details of the masonry and metalwork inspired me. I used the symbol of a tree that features in the metal hinge of an interior door in the nave. This budding tree form with 5 branches was ideal as the centrepiece for the designs because it is an elegant symbol of life and growth that would translate well within the shape of the windows. I have added banners for a biblical text and the name and dates of St Gertrude’s Church. The text provided by Father Matthew is taken from Psalm 106 – ‘GIVE THANKS TO THE LORD HIS LOVE IS EVERLASTING’. The script for text is based on lettering of Edward Johnson – an Arts and Crafts Calligrapher working in the early 1900’s who became most famous for his work on the typeface used in the London Underground. The style is a modern development of Romanesque manuscript writing and has been designed for the windows by a contemporary calligrapher, Liz Burch, with extra spaces for yellow stain to enliven the script. The same design is mirrored in each panel and the colours used are both cheerful and contemplative with the golden trees against various shades of greens and blues in a simple geometric leaded background. The windows overlook a park and the paleness of most of the glass allows for the trees and railings outside to be visible through the panels.